Diamond-Access Bank Merger: What’s in it for Stakeholders? By May 31 this year, technical details of Diamond-Access Banks’ merger would have been finalised, all things being equal. Subsequently, the process for integration of both banks would commence in earnest leading to a rebranding of what will eventually emerge by end of September or beginning of October as Nigeria’s biggest, and perhaps one of Africa’s largest lender by capitalisation and geographical spread. Anxiety of some shareholders and other stakeholders in some quarters is understood given the fact that many are wondering how the merger can squeeze value and guarantee competitive returns on equity (ROE). In fact, the underlying interest of an average investor is returns on equity, ultimately profit. Therefore, the question on the lips of a cross section of stakeholders has been: What will this merger deal offer? The single straight answer lies in the theory of economies of larger scale. Information gathered from recent interactions with key management staff of both deposit money banks spearheading the business combination processes indicate that over N150 billion could be saved as direct result of economies of large scale which will translate to returns on equity to shareholders. According to the business combination experts, the synergy will yield over N62 billion savings on the revenue side. They said that N40.9 billion would come from extended product offering while N8.4 billion from expanded digital channels. They also hope that N6.7 billion is going to be saved from the extension of market share in corporate and retail banking markets, and another N6.2 billion to be dug from treasury sales. That is not all the good side to what could be eked out from the merger. On the expenditure side, the managers believe that savings of N88.1 billion would be made; and from procurement and facility management a whopping N40.5 billion or about half of the savings is expected to come while N21 billion will accrue from cost of funds reduction through lower deposit pricing. More savings of N12.6 billion from IT integration; N13.5 billion from branch consolidation; and another N500 million to be squeezed from support functions integration, bringing envisaged total integration savings to about N150.1 billion. How realistic are the permutations? As to how this permutation will be realized and ultimately translate into good returns to shareholders, financial analysts at Proshare said they believed the merger would yield good returns to shareholders but cannot say for certainty how much returns. Proshare Managing Director and Chief Executive Officer, Mr Femi Awoyemi, told Nigerian Tribune that integration of the two banks is one of the best deals ever in Nigeria’s financial industry, stressing that the adoption of cutting edge technology platform of Diamond Bank and the ability to deliver seamless services to generations of customers would be of competitive advantage for Access Bank which he said is being run efficiently. As to what place the integrated Diamond-Access Bank will occupy in Africa financial markets, the financial analyst said technology and efficient service delivery makes all the difference in competitive financial markets of today. He said: “Let us just concentrate on building and integrating the bank. I have been to Access Bank in Kigali, Rwanda. Access Bank in Kigali is as efficient as anything. In fact, services they offer there are far better than what they offer in Nigeria. So, being a big bank in Africa is about services, it is about customers, it is about integrating regions. That is why I am keen about what they do with technology. Generally, the bank will do well because it is being run efficiently,” Mr Awoyemi concluded. Former Chief Economist/Group Head, Research & Economic Intelligence Group at Zenith Bank Plc, Mr Marcel Okeke, said it is going to be a good deal for all stakeholders. For the shareholders of Diamond Bank, he noted, a mark-up in the share price at the Nigerian Stock Exchange (NSE) already guarantees them instant returns compared to what the value had been pre-merger talks. Besides, for those of them who may choose to remain shareholders post-merger, they are going to be part of the bigger financial institution, probably the biggest in Africa in terms of customer base. He said that the role cutting edge technology and size can play in the banking market of today is tremendous, adding that going by the credibility of Access Bank, stakeholders are in for impressive returns. “So, they are going to operate as the biggest in Nigeria if not the African sub-region. This implies that they are going to become more profitable even though there are significant liabilities outstanding which I believe would be resolved,” said the financial analyst. But of greater importance in the merger scheme are customers of the bank who stand the chance of achieving a lot more through the combination of Access Bank and Diamond Bank. “The products and services that Diamond Bank’s clients enjoy, including its commitment to digital innovation, will continue unchanged and will be strengthened by Access Bank’s extra-ordinary commitment to customers, financial inclusion and sustainability, bolstered by the bank’s corporate expertise and strong balance sheet. “Together, we will bring the power of banking to millions across Nigeria, focused on speed, service and security. We are determined to ensure that both Access Bank and Diamond Bank customers will experience no disruption to normal banking services while we join forces to create Nigeria and Africa’s largest retail bank by customers,” a source at Diamond stated. With 3100 automated teller machines (ATMs), over 600 branches, supported by Diamond Bank’s bouquet of technology-driven products offerings including Diamondxtra and XclusivePlus, over 29 million customers of Diamond Bank and Access Bank, more than 13 million mobile customers are going to enjoy some reward scheme for using Diamond or Access Bank POS terminal, as well as same day clearing of cheques for Diamond and Access customers in both banks. Of greater comparative advantage to customers of both banks is the AccessAfrica initiative which guarantees service in all Access Bank subsidiaries – Nigeria, Ghana, The Gambia, Democratic Republic of Congo, Rwanda, Zambia and Sierra Leone. “The AccessAfrica service is available in all Access Bank subsidiaries – Nigeria, Ghana, The Gambia, Democratic Republic of Congo, Rwanda, Zambia and Sierra Leone. Our customers can now enjoy instant borderless banking from any access bank branch. 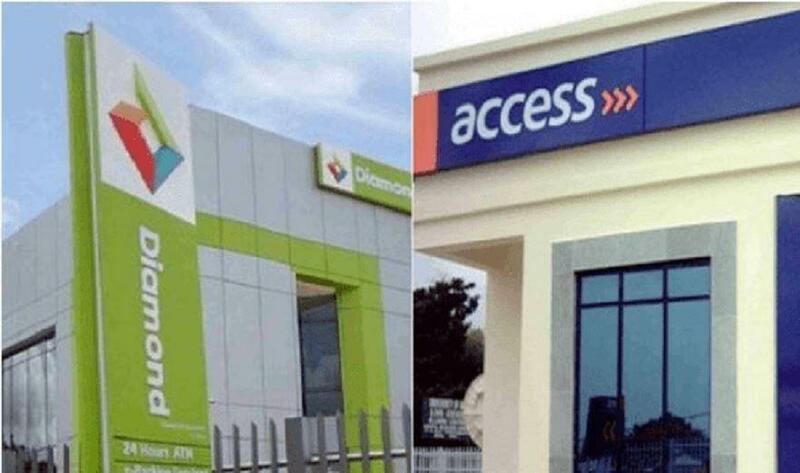 “When they walk into any Access Bank branch and initiate payment in their local currency, the beneficiary will receive an instant direct credit to their account or cash in their local currency,” said senior management staffers of Access and Diamond spearheading the merger processes.